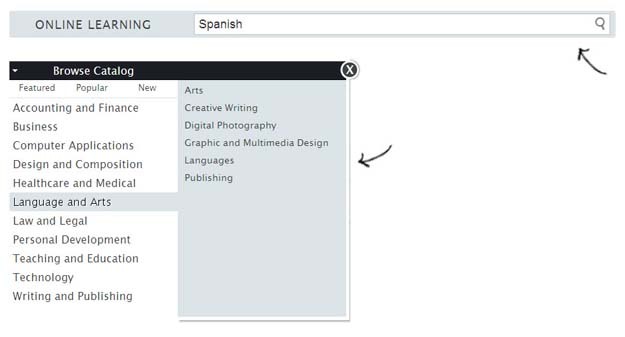 Find courses in two ways, either through the Search bar that appears at the top of every page of the site or by using the Browse Catalog navigation that appears in the column on the left of any page. The Search bar will suggest courses for you based on a search term, a course title, or an instructor's name. If you're not looking for a specific title, enter a keyword (such as photography or programming) that will bring up a range of titles for simplified browsing. Browse Catalog will display our entire catalog by department and course titles to allow you a broad view of our offerings.